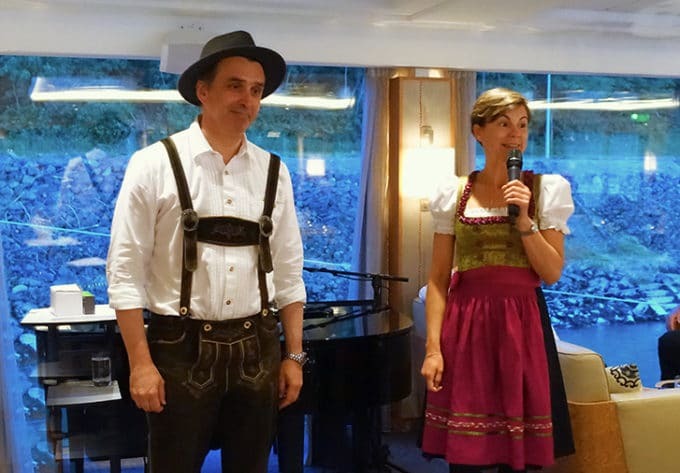 At the beginning of the summer, Lisa and I went on our first river cruise “The Danube Waltz” on board the Viking Longship Vilhjalm. Of course, we knew this would be the trip of a lifetime as we sailed down the Blue Danube, what we hadn’t counted on was having our own 5-star restaurant on board the ship. 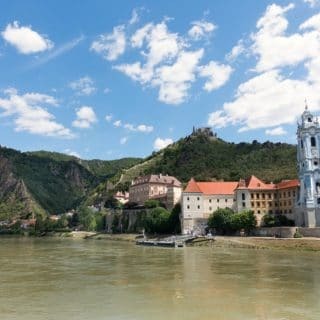 If you’ve never heard of Viking River Cruises click on the link to learn more. Being on a small ship makes all the difference in the world. 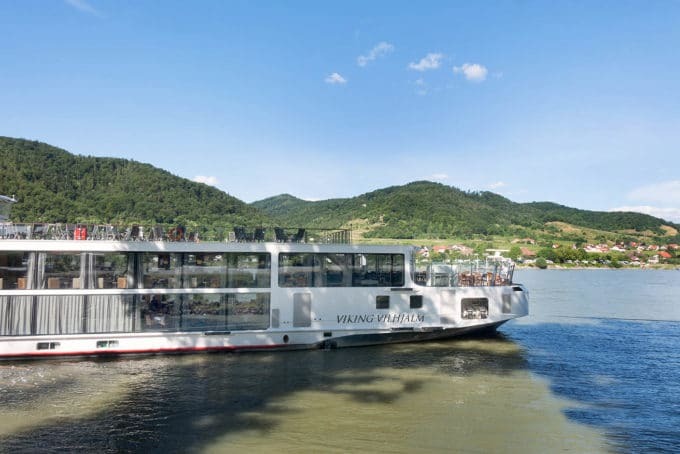 Viking River Cruises hold about 180 passengers which means a more intimate atmosphere and make life much easier for the staff to get to know you. This trickles down to the Ships Kitchen as well. 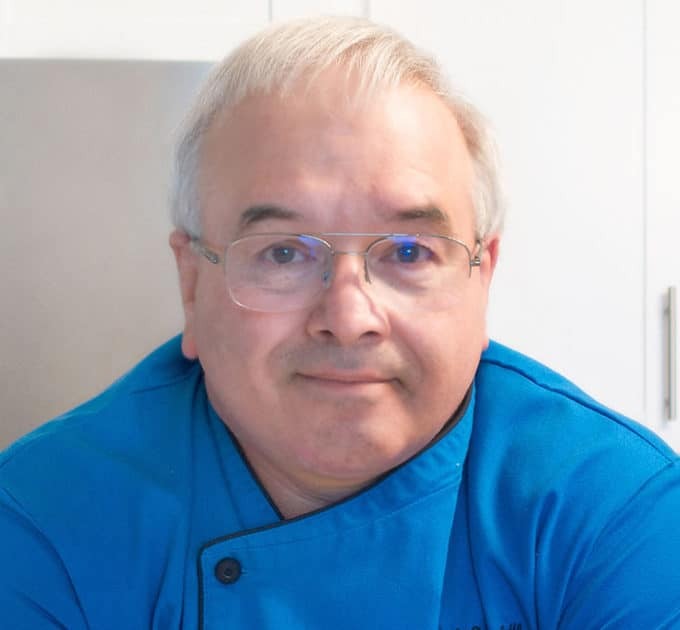 How often do you get to chat with the Chef and his staff during the cruise? 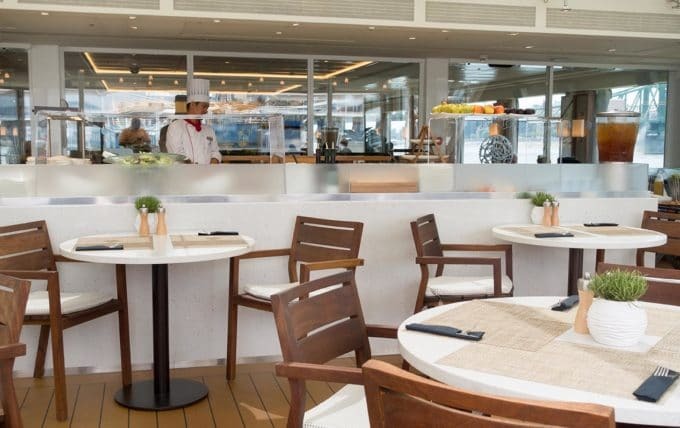 You can have lunch or dinner outside in the Aquavit Terrace on the upper deck or downstairs in the main dining area. 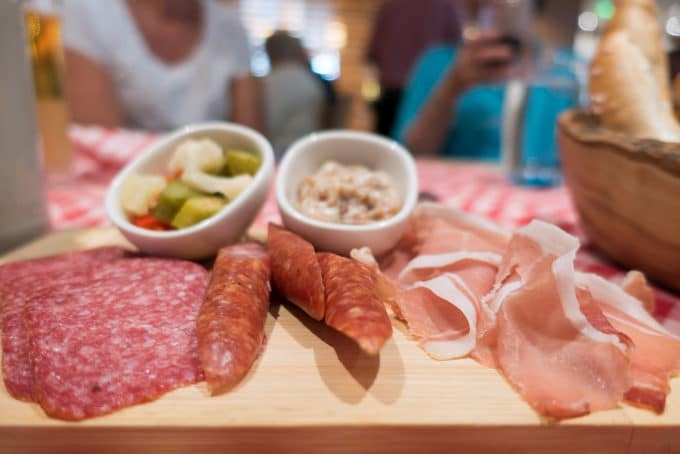 What Kind of Food Can I expect on a Viking River Cruise? 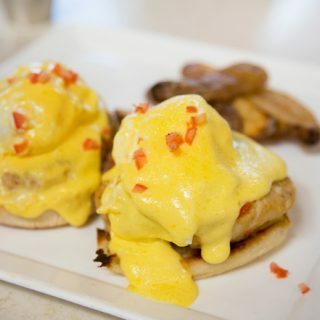 Breakfast is served in both locations with earlier service in the Aquavit Terrace. But if you’re a late sleeper like me (on vacation) you’ll opt for full breakfast service with everything your heart could desire. 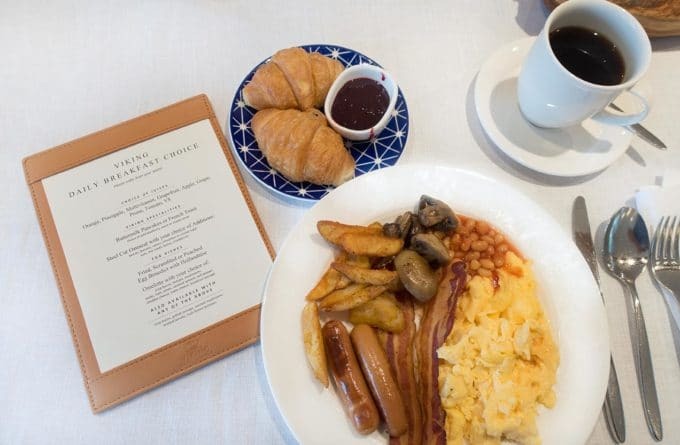 They serve a very European style breakfast with added American options. But the overall flair of the meals seems to match the travel destination. Do I have to Eat in the Main Restaurant? Most afternoons you’re not on board ship, choosing to stay in town and find a cute little restaurant to have lunch at. Or out on one of the available afternoon excursions which usually include lunch. 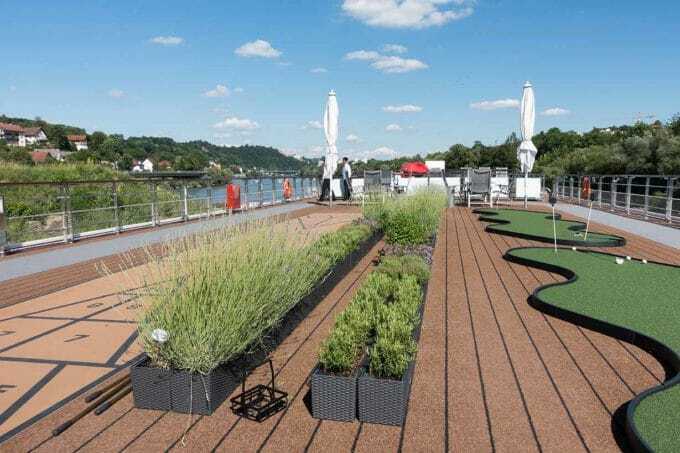 But if you’re in the mood to just relax on the river and enjoy a quiet lunch Viking River Cruises has got you covered. 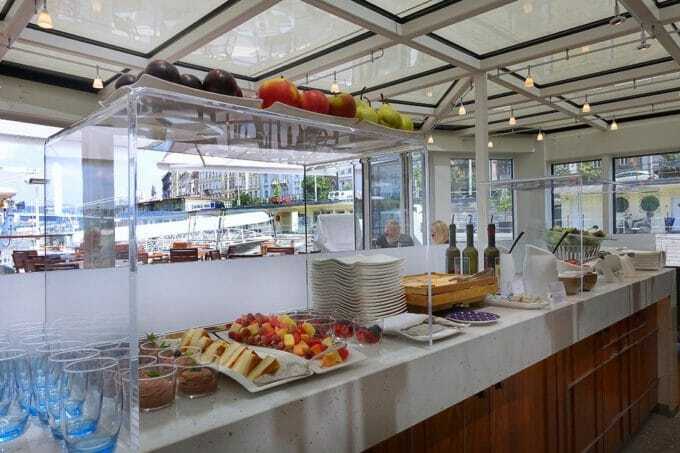 Meals are available on the Aquavit Deck for all three meals. Lunch fare is simpler but plentiful. I promise you’ll find something delicious to eat and walk away full and happy! Dinner is when the kitchen really shines. 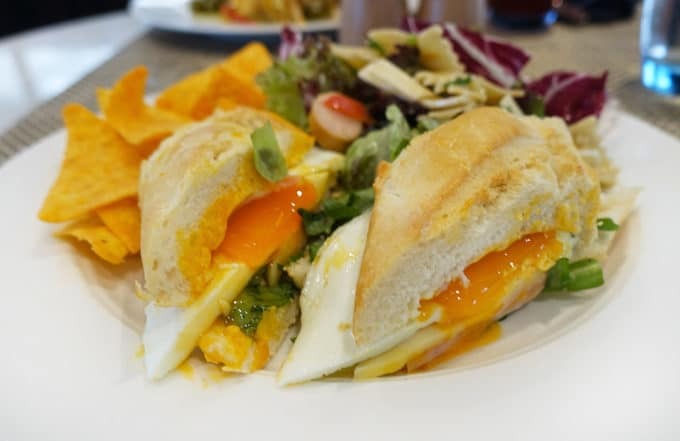 You have a choice of appetizer, entree and dessert that changes each night, with additional items that are always available if you nothing strikes your fancy. Everything was delicious and beautifully plated giving every dish that Wow factor. After all, we eat with our eyes and a good first impression means everything. 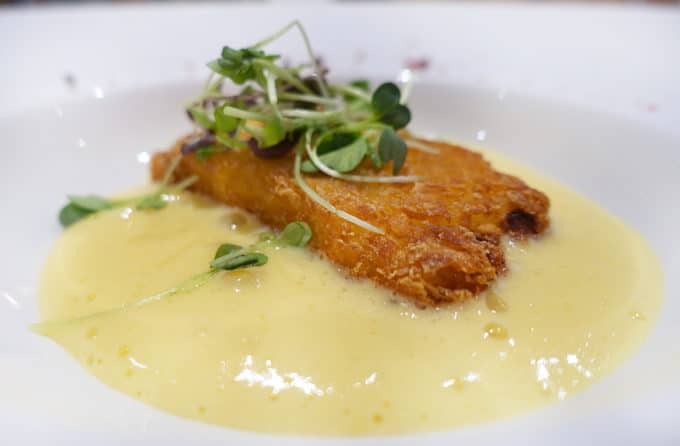 This Fried Mascarpone appetizer was one of my favorites! 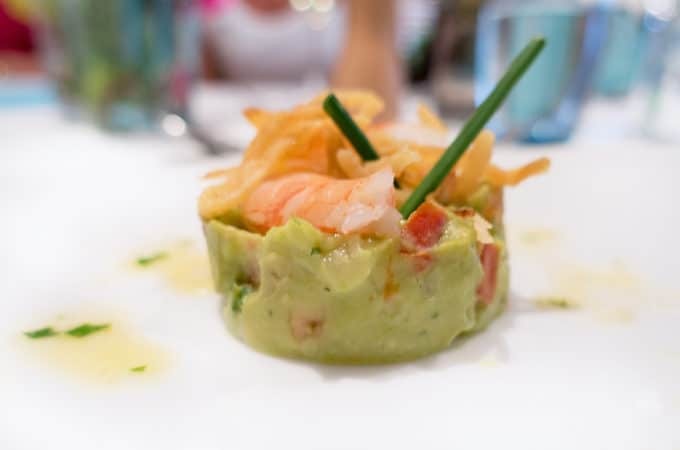 And this lime marinated poached shrimp and avocado tartare was exceptional…..sigh. 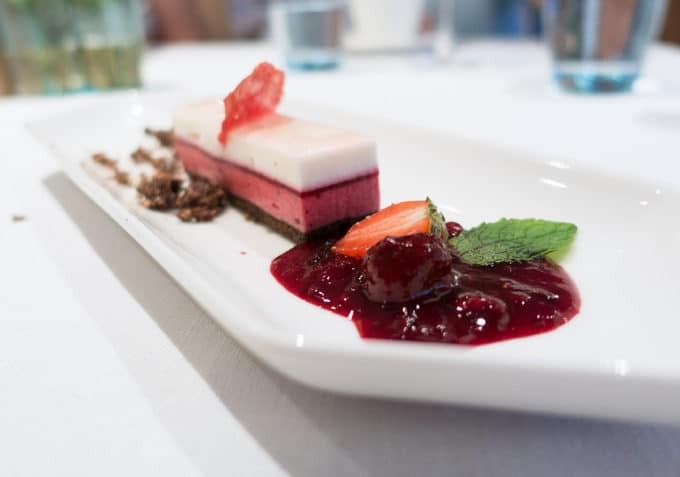 After enjoying your appetizer, the main course arrives with all the flourish and panache of a Michelin starred restaurant. 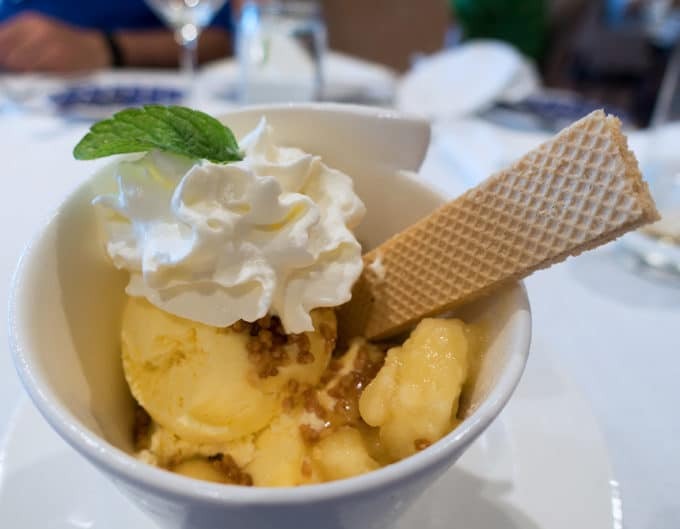 How are the Desserts on a Viking River Cruise? 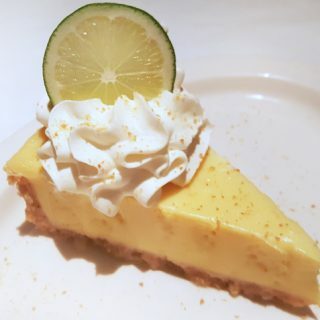 Then dessert arrives…. It’s a beautiful thing! 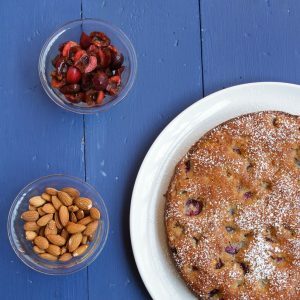 And if you’re not in the mood for one of the Viking Signature Desserts. There’s always ice cream. You gotta love the Viking kitchen staff, they make everything special! 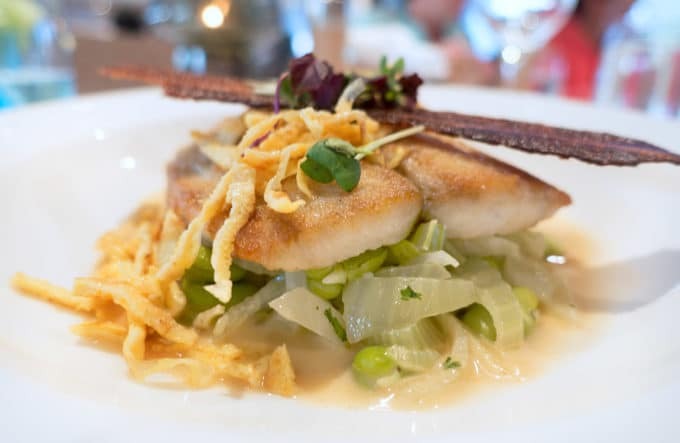 Will There be Regional Dining Specialties? Once during the cruise, they have a special dinner celebrating the local cuisine. 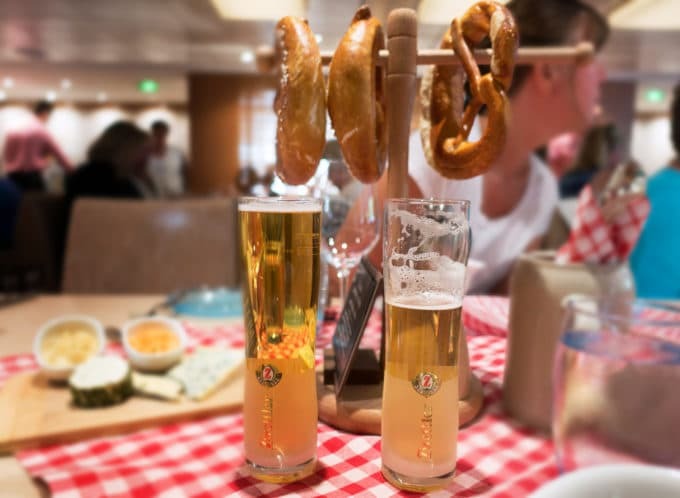 I’m still dreaming about those pretzels and why does beer taste so much better in Europe? We got to taste the local specialties and the Austrian meats were only outdone by the Austrian cheese selection. And of course, the entree’s were perfectly prepared and oh so delicious! 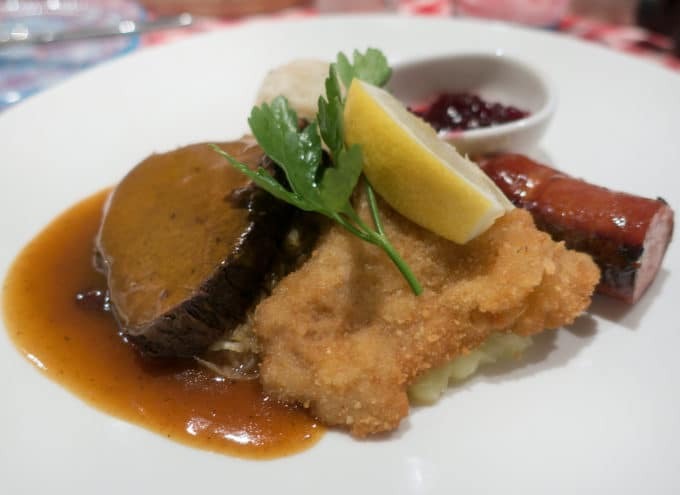 This typical Austrian fare and the party that came afterward made our cruise so very special. Not only did we make new friends amongst the passengers we counted many of the crew as friends as well. They made our experience exceptional! did I mention that each Viking Longship has their own herb garden on board? Just another reason to love Viking! Previous Post: « The Best and Easiest Strawberry Gelato Recipe You’ll ever Make! 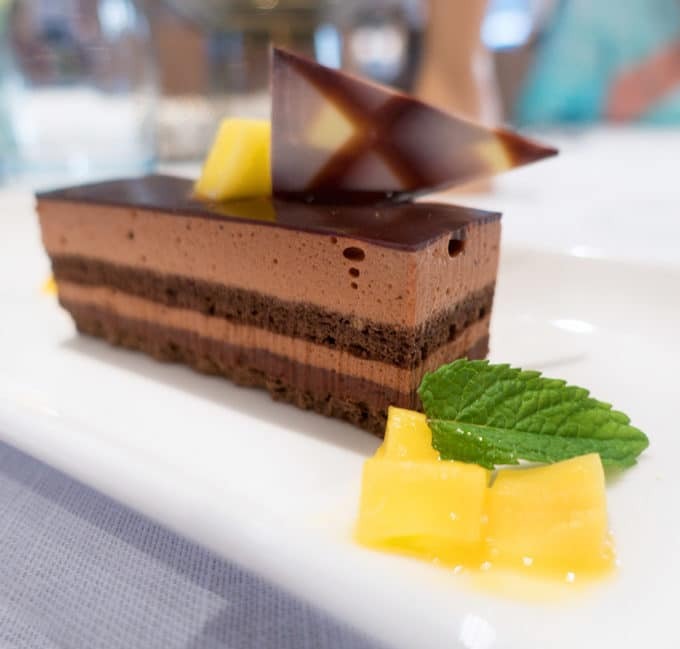 Do you know what the pattern/manufacturer of the dinnerware they use on the River Cruises? White, wave pattern. If I don’t eat fish or lamb are there other option for dinner. I am a very plain eater. There are three choices nightly and they always have four other options available, including Chicken and Prime Rib. The folks at Viking do their best to accommodate every passenger. Agreed! 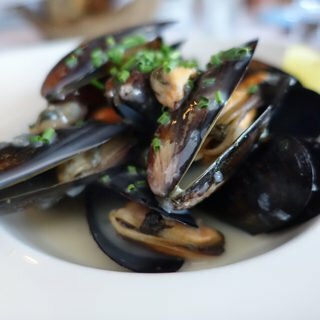 We did the Romantic Danube last month on the Viking Var and the food and wines/beers were excellent. I could go for a Mozart coffee and scone with clotted cream as we speak! I wouldn’t mind joining you for that deliciousness Karen! I’ve been on three Viking Cruises–Tulips and Windmills, Elbe River, and Portugal’s River of Gold–and every one has been wonderful! The food, the intimacy, and the crew absolutely make the cruise. Can’t wait to experience my next Viking cruise in September 2018. That will be my first Viking ocean cruise–the Eastern Seaboard. I’m sure it will be just as fantastic, even with 930 passengers! Thanks for stopping by Jolynn. I’m happy to hear you enjoyed the same level of service and deliciousness I did. I’m hoping to try their ocean cruise next year. 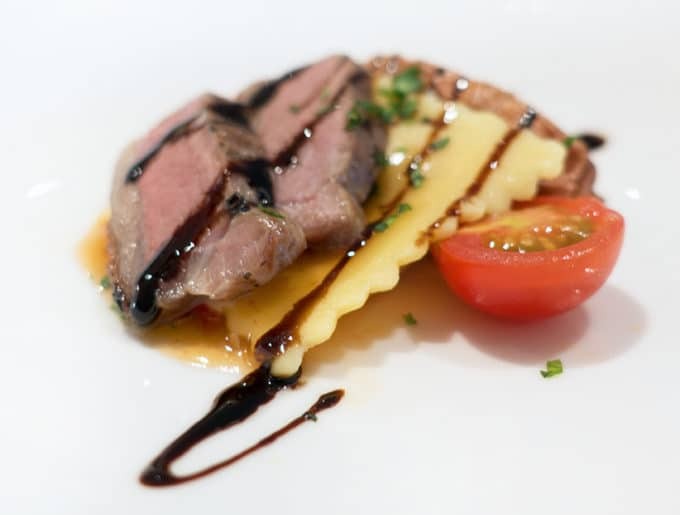 We have enjoyed two Viking cruises and fully agree with everything you told readers about the food. Seeing the towns, villages and history up close was great. They really do a great job with the tour. It makes seeing Europe very easy. 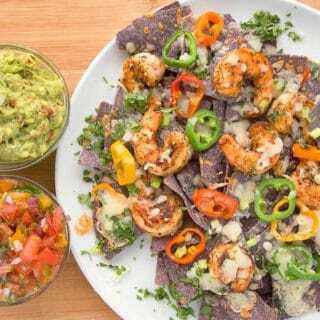 Will you be posting any of the recipes from your “Viking Cruise” Like the “lime marinated poached shrimp and avocado tartare” ? Your pictures are mesmerizing! Love the whole experience. I’m bookmarking this for when I get to visit one day! I was always curious about how good the food is on a cruise. But this looks so amazing with all of the gorgeous looking food. I would have had no worries. Looks like your experience was wonderfully tasty. I would love to try austrian cheese. Maybe I have and don’t realize it. It really was a great trip Jill! You must have had a good time during the cruise and by the pictures I can see that you also had great food. I certainly did Grace, it was Awesome! I’ve never heard of the Viking river cruise before your article. It sounds really interesting , Thanks for sharing! I have never been on a cruise earlier. And your pictures and your writing make it so tempting to book one. it was so much fun, you would love it! I agree each and every dish had a WOW factor. I can’t imagine how good they tasted! The desserts are beautiful but I’d be in heaven with the charcuterie platters, omg! 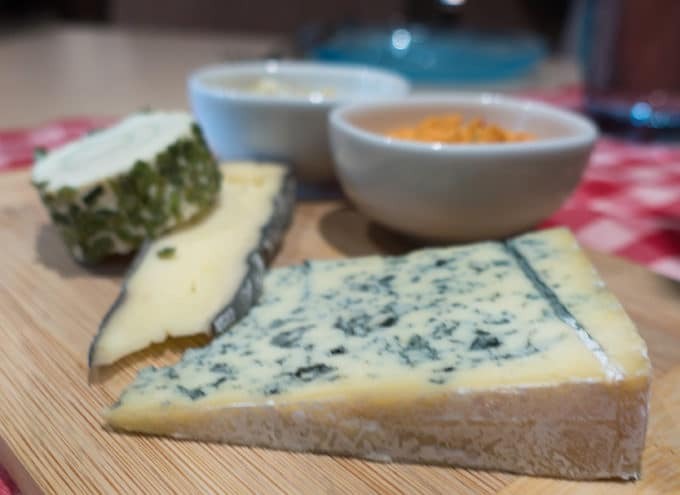 And the cheese, I know blue cheese is an acquired taste, but I absolutely love it! 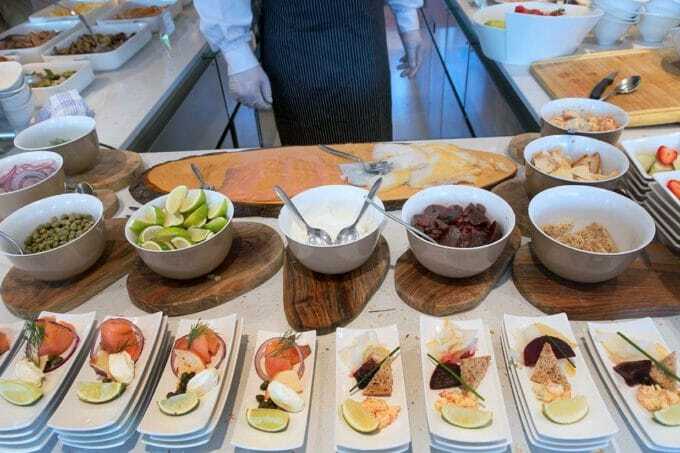 Is it wrong to want to take that cruise just for the food? I love the concept of the chef being accessible and I REALLY want to eat a few of those lime marinated poached shrimp and avocado tartare. Looks like you and your wife had a blast. All the dishes look so delicious. I would love to try out the chocolate mousse cake and the strawberry dessert. We did Glenda, it was truly the trip of a lifetime! I’ve never heard of the Viking river cruise before your article. It sounds much more intament and special than one of the larger Cruise Lines. The food looks so good in your pictures I’m sure it was a luxurious experience tantalizing your taste buds on the whole trip. it is a lot more personal than the larger ocean cruises. Viking has some great ocean cruises too!